How to tell if you can play PS2 games on your PS3. While all PlayStation 3 consoles can play original PlayStation discs, not all models are PlayStation 2 compatible. If you want to play PS2 games of your PS3, then you need to make sure you buy the right model. There are a few PS2 discs that will not work on any PS3 model. Gamers could previously download PS2 classics, but Sony closed the PS3 store in 2018. Look to see if the PS3 is a PlayStation 3 Slim Model. You can tell if a PS3 is a slim model if it has a lower profile, a matte black finish (not shiny), and the PS3 logo on the top instead of the word "PlayStation 3." If it's a PS3 Slim, then it isn't PS2 backward compatible, though you can still enjoy PS3 and PSone games on it. Look to see if the PS3 is a 20GB PlayStation 3. These were available at launch only. They do not have Wi-Fi nor a flash card reader, but they do have four USB ports and are backward compatible. The model number is usually "CECHBxx." These are also bigger than the PS3 Slim, have a shiny finish, and the word "PlayStation 3" written on top. 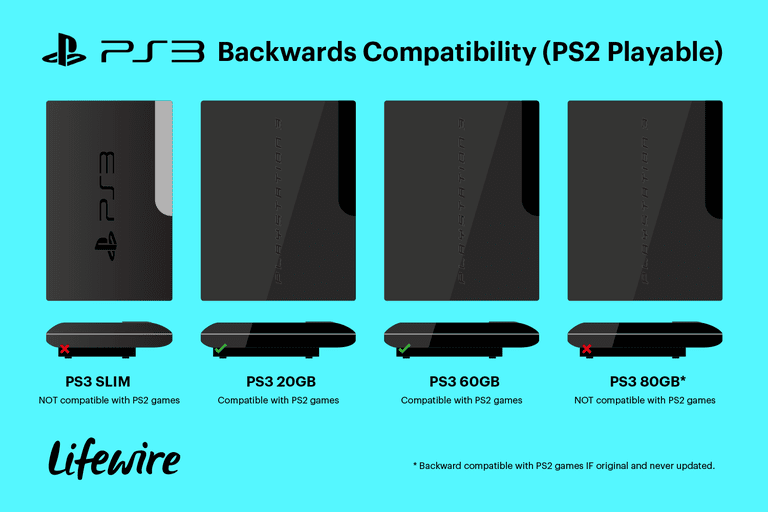 If your PS3 has four USB ports, and the panel where you insert the disc is black and not silver, and it doesn't have a spot on the front for SD cards, then you have a 20GB PS3, and it is backward compatible with PS2 games. Look to see if the PS3 is a 60GB PlayStation 3. These were also only available at launch. They have Wi-Fi, a flash card reader, and four USB ports. Like the 20GB model, the 60GB model is shiny and has the word "PlayStation 3" on top. The face where you insert the disc is also silver. If you have an 80GB PlayStation 3, or a Metal Gear Solid PS3, that hasn't been updated since it came out of the box, it may still be backward compatible through software emulation. If you use any PS3 online services, then your console has likely lost the PS2 software emulation backward compatibility. Because the newer PS3 models can't play PS2 games, used 20GB and 60GB PS3 consoles often cost more than a brand new PS3 Slim. Now that Sony has closed the PlayStation 3 store, you can't even download old PS2 games on the PS3. Therefore, your best bet for playing old PS2 games is to buy a used PlayStation 2 if you don't already have one.